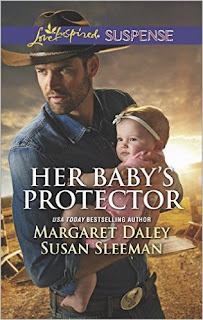 Saved by the Lawman by Margaret Daley. Officer and ex-Marine, Chase Walker, must protect widowed family court judge Kate Forster and her infant son after someone attempted to kidnap the baby. This is a good, action-packed, suspense-filled, clean and romantic short read. Saved by the SEAL by Susan Sleeman. Bree Hatfield finds herself taking custody of her best friends' daughter, Ella, when they were tragically killed. Bree believe they were murdered, even when it was ruled as an accident. She contacts her ex-boyfriend and Navy Seal, Clint Reed, for help. I loved watching these two together and what they will do to protect little Ella. Another good, clean, suspenseful and romantic short read. I received this book from the author but was not required to write a review, which was of my own opinion.